It can be hard to get a room full of people to agree on a single subject, but we think that almost everyone can agree that it’s not a pleasant feeling to have sensitive teeth. Twinging dental pain could be caused from a variety of sources. Your dentist is here to unveil the hidden causes of tooth sensitivity. Before we dive into the surprising reasons why so many people experience tooth sensitivity, it may be helpful to understand it thoroughly. The most important thing to remember when considering the causes of tooth sensitivity is that the inside of your tooth is already sensitive and will always be sensitive. Your dental crown protects it from foreign materials, dental bacteria, and food particles. The layers of our teeth consist of enamel (outermost protective layer), dentin ( the majority of our teeth), and the pulp (inside roots and nerve endings of our teeth). The point of your enamel is to protect the inner, more sensitive, inner layers of your teeth. Let’s dive right in! It’s time to get down to the bottom of the cause of your tooth sensitivity. If you chew ice, you should stop right away! Not only can it traumatize your teeth with a dental emergency, but it slowly wears away the enamel of your teeth. 2. You have an imbalance in your diet. Eating a lot of acidic foods can harm your teeth over time. Although fruits are good for you, remember that it’s important to have a balanced diet. 3. You brush your teeth too hard. If you use a hard-bristled toothbrush or just brush your teeth too aggressively, you may be wearing the enamel on your teeth away. If you have questions about brushing, ask your dentist about the best tools and techniques to use. 4. You bleach your teeth too often. When you receive a bleaching treatment, your dentist probably warns you about a brief period of sensitivity after using professional-grade products. If you use excessive bleaching products from home and often, you may be permanently damaging your smile. 5. You’ve had recent dental work. It’s common to experience slight tooth sensitivity after dental procedures. Although pregnancy doesn’t directly cause tooth sensitivity, the hormones in a woman’s body are changing. These changes may result in discomfort in your gums and teeth. Sounds crazy, but a sinus infection can make your teeth hurt because of the abnormal pressure that inflammation causes. 8. It’s too cold outside. You may be thinking, wow, what won’t make my teeth sensitive? It’s true. Chilly air flowing can trigger a sensitive twinge. Stress is one of the leading causes of bruxism (teeth grinding). When you consistently grind your teeth, the enamel may begin to wear. 10. You have a split tooth. 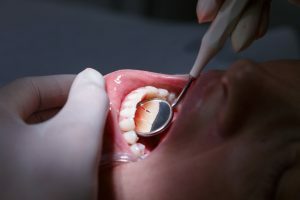 If you feel sensitivity only when you bite down, you may have some dental damage present. It’s best to visit a dentist for a thorough exam. With so many possible causes for tooth sensitivity, it’s best to leave diagnoses up to the experts. If you have sensitive teeth, reach out to your local dentist. When you’re experiencing dental pain, you should always turn to your local expert at Vanderbrook Family Dentistry for help. Dr. Drew Vanderbrook is proud to offer the latest dental tools and techniques to ensure excellent dental experiences. If you would like to speak with him, feel free to reach out to our dental office.